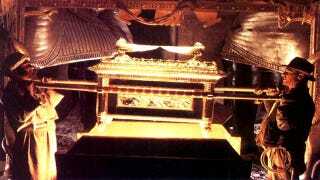 After the Babylonian siege of Jerusalem in the 6th Century B.C.E., the Ark of the Covenant disappeared from religious records. Where did it go? Here are seven incredible, conspiracy-minded theories. TIn an account written within the second book of Maccabees, an account of Jewish history during the Babylonian captivity written in Greek during the 2nd Century B.C.E., suggests the Ark narrowly survived the Babylonian siege. The tale by which the Ark reached Northern Ethiopia is interesting, as the church believes Menelik, the child of Solomon and the Queen of Sheba, absconded the true Ark of the Covenant in the 13th Century B.C.E. and took the Ark to Ethiopia, leaving a clever fake in its place. The top image and warehouse image are from the film Raiders of the Lost Ark. Additional images from Avon Books and Adam Cohn/CC. Sources linked within the article.